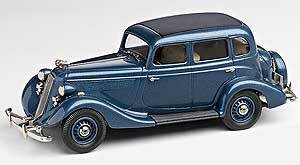 1934 Studebaker Commander Land Cruiser Sedan, finished in bruce light blue. Model number eight in the new Brooklin Models Limited range. Brooklin Limited 1937 Studebaker Dictator Coupe BML06, finished in grapestone maroon. Model number six in the new Brooklin Models Limited range. 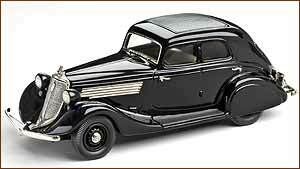 Brooklin Models 1934 Studebaker Commander Landcruiser sedan. Brooklin Models 1935 Studebaker Dictator 4-Door. 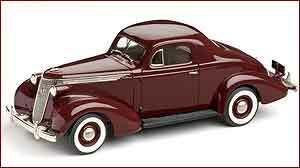 In 1934 Studebaker had introduced a streamlined design across all models. For 1935 the design was further refined and the number of model choices increased.The Dictator Six offered no less than 13 body styles ranging from the three window coupe to the Dictator Land Cruiser. 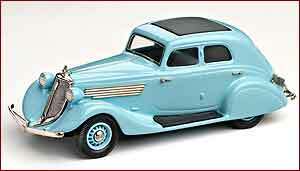 Our model is the Dictator Six 1-A series, the lowest priced sedan, which sold for $750. 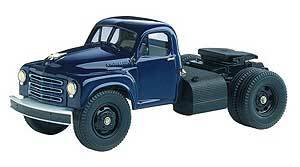 Nearly 12,000 examples of this model were produced during the 1935 model year. Our model is finished in Gulf Stream Blue Poly. 1:43rd Scale model, hand built, in heavy white metal. 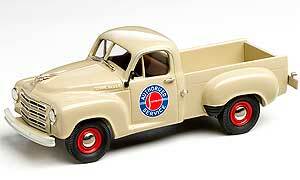 Brooklin Models 1954 Studebaker Commander 2-Dr Coupe. One of the masterpieces created by the famous American designer Raymond Loewy. Reflecting European simplicity this car was one of the most distinctive of the period. 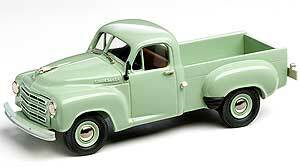 1952 Studebaker R-5 Pick-Up by US Model Mint. 1:43rd Scale model, hand built, in heavy white metal. One of Americas oldest truck manufacturers, Studebaker started back in 1852 at South Bend, Indiana, building horse drawn wagons. 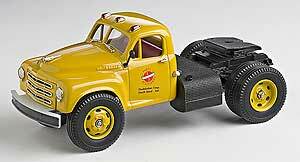 This 1950 Wrecker would have been a typical site on the US highways and byways. Studebaker trucks were way ahead of their time with easy-chair comfort and the worlds finest ventilating system they were also fitted with many safety features. The brochure said 'Extra driver comfort in the roomy, big-vision Studebaker cab! You get easy-chair comfort, and the world's finest ventilating system!' These 2-ton tractor units were ahead of their time, filled with many safety features.